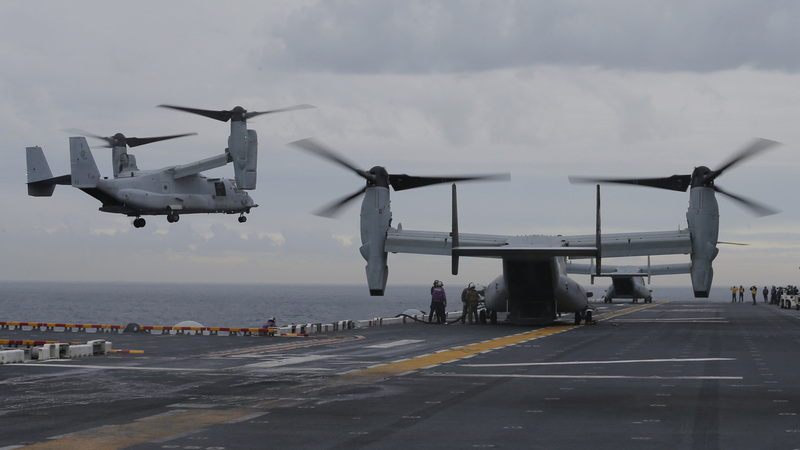 3 U.S. Marines Declared Dead In Crashed Osprey Plane : The Two-Way A rescue effort had saved 23 of the 26 service members who were on the plane when it went down on Saturday off the east coast of Australia. The wreckage of a U.S. Marine Osprey has been found underwater off the coast of northeast Australia. The aircraft had taken off from the USS Bonhomme Richard amphibious assault ship, seen here during exercises earlier this summer. Three U.S. Marines who were missing in the crash of an Osprey aircraft on Saturday have been declared dead. The Pentagon identifies them as 1st Lt. Benjamin R. Cross, 26, of Oxford, Maine; Cpl. Nathaniel F. Ordway, 21, of Sedgwick, Kan.; and Pfc. Ruben P. Velasco, 19, of Los Angeles, Calif. The MV-22 Osprey went down off Australia's east coast. The Australian navy found the wreck on Monday, one day after a search and rescue effort for the final three missing Marines aboard the plane was suspended. The rescue effort saved 23 of the 26 service members who were on the plane when it went down on Saturday, in what the Marines called a "mishap." The Osprey had taken off from the USS Bonhomme Richard, an amphibious assault ship. The wreckage was located in Shoalwater Bay off Queensland by the HMAS Melville, a Royal Australian Navy survey ship, shortly after the Melville arrived to help in the search effort. After the discovery, a diving team was sent to the area and landed on the Melville; Minister for Defense Marise Payne said the divers would "conduct remotely operated underwater vehicle operations." "'The loss of every Marine is felt across our entire Marine Corps family. To the families of the brave Marines we lost – there is no way for us to understand what you are going through,' said Col. Tye R. Wallace, Commanding Officer, 31st Marine Expeditionary Unit. 'What we do know is that your Marines left a lasting impression on the 31st MEU, the Marine Corps, and the world. They will live on forever in our thoughts and our hearts. You will always be a part of the Marine Corps family, and you will remain in our prayers.'"